opportunities to live, work and learn. 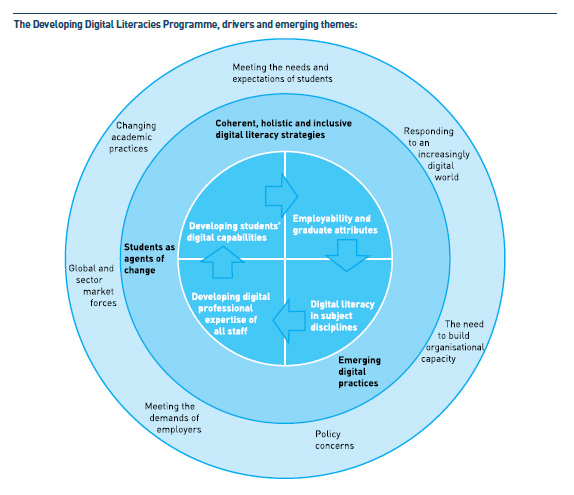 Digital literacy: those capabilities which fit an individual for living, learning and working in a digital society. Read the full JISC briefing paper. The ODHE’s joint primary contacts for this work are Jean Harrison, Chair of ODHE and Meriel Box, Deputy Chair. Together they provide a complementary mix of a Director of HR and Head of Learning Development. They are not digitally literate and hence are typical of their group. They are, however, deeply involved with OD and will draw on this experience to provide a strategic steer and to advise on how to engage people like themselves with digital literacies. They will be supported by a very digitally embedded colleague. Dr Bex Lewis has responsibility for embedding digital literacies among academic colleagues at the University of Winchester. She has recently co-led the JISC funded BODGIT project with the ODHE which sought to explore the interface between digital literacy and organizational development. At Winchester, Bex leads the PGCLTHE module on Blended Learning, and has undertaken online skills-focused and accessibility projects. She ­­is on Learning and Teaching, Learning Network (Moodle) and Distance Learning Committees. In roles beyond the University, Bex is Director of Digital Fingerprint, a social media consultancy that works particularly within the HE and Christian sectors, including digital literacy workshops for the Church of England. She runs The Big Bible Project for the University of Durham, encouraging ‘bigger Bible conversations’, promoting digital literacy amongst Christians, a project extended to a second year because of the value demonstrated. She is an early adopter of social media tools, using them in everyday life since first developing a website for her PhD, giving her an international profile. She has a growing profile as a speaker, including forthcoming European engagements. Bex has developed a particularly strong Community of Practice through a combination of social media and conference attendance, with connections in both FE and HE. She was on the International Review Board for the Plymouth E-Learning Conference 2011, and presented twice at the Association of Learning Technologists Conference 2011. 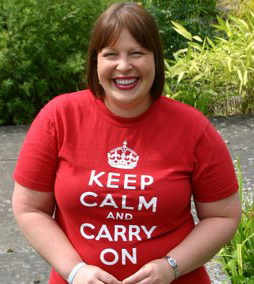 She is a member of the JISC Learning & Teaching Experts Group. She has attended a number of JISC workshops, and is a regular super-delegate for its online conferences. Bex is the Learning with Technology Specialist who will be responsible for the implementation of programme-wide technology enhancements for assessment and feedback on up to 33 programmes as part of the newly funded JISC project, FASTECH. This will combine her skills as an education technologist with her knowledge and experience of organisational development. Members of the ODHE are well placed to understand and support change processes within institutions. They engage at all levels, act on Senior Management’s instructions, and can promote useful information flows up, down and across the organisation. These dialogues help deal with the complex and multi-layered nature of change. DLs are becoming increasingly embedded within organisational processes. Few, if any, organisational changes do not have DL aspects. HE Staff cannot escape engagement. As the Times Higher Education comments, current hierarchical modes of working are outmoded. For many this is a positive, democratic change, for others, an unwelcome shift. Change management is a core aspect of Organisational Development (OD) and practitioners are therefore central to embedding a more digitally literate culture. Anecdotal evidence suggests that many OD practitioners are not comfortable with DLs. Opportunities for the effective use of DLs can easily be missed or not enthusiastically promoted. This bid is about helping organisational developers to gain confidence with DLs through building better understanding of best practice. ODs would then be able to contribute much more effectively to organisational take-up of DL initiatives. The University of Winchester has worked with the ODHE as part of the JISC funded Embed-IT project, on a project ‘Bringing Organisational Development Guidance into IT’ (BODGIT). Findings demonstrated the need to share experiences to reduce ‘silo’ cultures (although most academics have strong affinity to their disciplines) and to demonstrate clear benefits to staff: the arguments that count are likely to relate to saving time and improving the student experience. The project framework was especially useful in highlighting the importance of change management and encouraging us to apply general change concepts to IT, recognising the huge pressures colleagues are experiencing; and their differing levels of interest. A number of OD changes have resulted at the University of Winchester, opening up increasing opportunities for dialogues with IT staff, and within disciplinary settings. A programme of problem-solving (rather than tech-tools) workshops, run at short interventions, combined with case studies, has led to an increasing number of colleagues embedding digital formats at a programme level. The partnership worked well, and Winchester is keen to run as a test-bed for the project, exchanging knowledge and practices. The ODHE can affect the practice of its own members: by engaging with a reference group of interested colleagues; by sharing the lessons from this and earlier projects; by keeping the topic on the agenda of meetings; by gathering examples of effective practice to cascade through institutions; by running DL sessions to build capacity, and by making more regular use of online methods such as web-conferencing. Case studies are being collated on an external blog: http://www.winchester.ac.uk/blog/archive/tags/Blended%20Learning/default.aspx, with more sensitive information shared within the VLE.